There are a myriad of ways to load AutoLISP applications in AutoCAD, including acaddoc.lsp, an .mnl file, the Startup Suite, and manually by various means. For application developers wishing to deploy their applications to others, all of these methods have drawbacks. The ideal solution should be easy to implement in an installation program, require minimal or zero changes to the user’s AutoCAD configuration, work the same way across all versions of AutoCAD, and easily undone when the application is uninstalled. ObjectARX application developers have long used registry demand loading to load their applications automatically, either when AutoCAD starts or when the user enters a command that the application defines. Registry demand loading is relatively easy to set up and meets the other requirements for an ideal solution, except for one problem: it works only with ObjectARX modules (or with .NET modules in AutoCAD 2006 and later). Many years ago, I created a solution to this problem by building a small stub ObjectARX module that did nothing but load an associated LISP file. This effectively allows the registry demand loading mechanism to be used for loading a LISP file. If you develop AutoLISP applications that could benefit from registry demand loading, then I have a Christmas present for you: LspLoad.zip contains a complete suite of newly updated stub modules for all versions of AutoCAD from AutoCAD 2000 to AutoCAD 2010, plus modules for Bricscad 9 and 10, which also supports registry demand loading. To use the stub modules, just rename them so that the base filename matches your application’s main LISP filename, then install them in the same folder as the LISP file and create the registry demand load entries. The only work you have to do is to get the stub module to load. You can simply drag and drop the appropriate stub module into a running instance of AutoCAD in order to test it. In this screen shot, I created an application called “!LspLoadTest” (the “!” was added just so it displayed at the beginning of the list). I added the minimum required subkeys. The LOADER string value is set to the complete path of the stub module, and LOADCTRLS is set to a value of 2, which means I want the application loaded when AutoCAD starts. 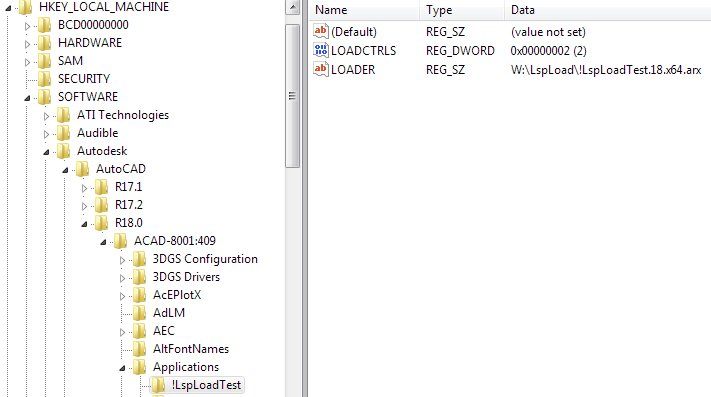 LOADCTRLS is a bit coded value; for use with LspLoad, it’s only useful values are 2 or 4. A value of 4 means “load when my command is invoked”; this mode requires a COMMANDS subkey that lists the defined commands. These files are free to use for any purpose. Have a great holiday, everyone!